The island of Kauai is the opposite of the Bay Area this time of year. By the time you read this, the smoke has perhaps cleared in the Bay Area and Northern California. Or, perhaps it hasn't. After all, the Camp fire that began on Nov. 8 was the most destructive and deadly wildfire in state history. Typically, in our annual holiday getaway guide, we highlight vacation gems in Northern and Central California. But considering the unhealthy air we've been breathing recently, we've decided to focus on some getaway spots that are truly getaways — as in, out of the state. Most of the locales on our list also offer a green alternative to our brown, dry Bay Area landscape. Of course, if you decide to get out of town this holiday season (or this winter), we strongly suggest that you first do all of your shopping locally. The East Bay is blessed with some of the best shops for gifts and artisan offerings in California (see the rest of this Holiday Guide). Also, we strongly urge you to donate to California fire relief causes (or other worthy charities we highlight on our Smash the Patriarchy for the Holidays story) . Lots of folks, unfortunately, have no place to call home this year, and they need our help. When we said, "get away," we meant it. Kauai, in many ways, is the polar opposite of California this time of year (at least before the rains arrive in the Golden State). The Garden Island is deeply, lushly green, and feels as if it's worlds away. If you go, you must spend time on the island's gorgeous North Shore. Hanging out in mellow Hanalei Town, on Hanalei Bay, or nearby Princeville, is guaranteed to melt away the stresses of life in the Bay Area. Stroll through the town's galleries and shops or just relax on some of the prettiest beaches in the world, including Lumahai and Ke'e. We also believe wholeheartedly that spending time in nature is the best way to rejuvenate. And the North Shore is one of the best places to do it. 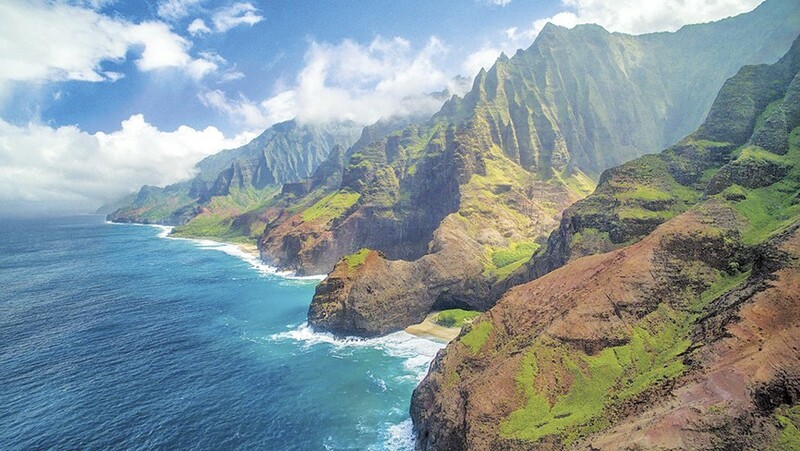 We're talking about the Napali Coast — 17 miles of stunning coastline, 3,000-foot cliffs, and towering waterfalls. Go for a long hike, or if weather permits, rent kayaks and explore the sea caves (The Napali Coast is supposed to reopen in 2019 after closing last year due to mudslides). Kauai's South Shore is also a relaxing spot to hang out — especially if it's raining on the wetter North Shore. Go snorkeling or surfing in Poipu Beach, or simply use the South Shore as a jumping off point for the rugged, mind-blowingly beautiful West Shore. A must see: the sprawling Waimea Canyon (known as the Grand Canyon of the Pacific). Take a hike along the 3,600-foot-high rim or tromp through dense rainforests nearby — full of streams and waterfalls— that get hundreds of inches of rain a year. Kauai is known as a hiker's paradise; you'll find out why on the West and North shores. Vancouver is one of the greenest cities on the West Coast — it gets about 45 inches of rain a year — and it's one of its most picturesque. It's also an urbanist's dream: tall, densely built housing (it's about 2.5 times as densely populated as Oakland), surrounded by acres and acres of parks, plus walking and biking trails along miles of waterfront. Of course, being a cosmopolitan city of 610,00, Vancouver features numerous great restaurants, museums, shops, and galleries. But we're all about the outdoors, which means spending quality time in Stanley Park, one of the best city parks anywhere. And greenest. At about 1,000 acres, it's roughly the same size as Golden Gate Park, plus it's full of hiking and biking trails and rimmed with beaches. Also, don't miss Capilano Suspension Bridge Park, a Vancouver landmark featuring a wobbly 450-foot-long walking bridge, 250 feet above the Capilano River, or the Treetops Adventure and its seven walking bridges amid the giant Douglas Firs. Just north of Vancouver are dozens of parks full of hiking trails amid forests, rivers, and lakes. One of our favorites is Blue Gentian Lake. And of course, Vancouver is the perfect launch pad for some of the best skiing and snowboarding on the West Coast — at Whistler, home of the 2010 Winter Olympic Games' alpine events. Ashland has made our annual getaway guide before — mainly because it's one of our favorite towns on the West Coast. Known best for the annual Oregon Shakespeare Festival, Ashland is also a great destination spot for the holidays. Each year, the city hosts its Festival of Light Celebration in the historic downtown district. Spend a weekend walking through 19th-century downtown, hanging out in cafes and shops, or sipping wine at restaurant along meandering Ashland Creek. A must see is the historic 1920s Ashland Springs Hotel. Or hike up Ashland Creek through wooded Lithia Park to Granite Street and Reeder reservoirs. Nearby, there's also skiing and snowboarding on 7,500-foot Mount Ashland. If you drive, we also suggest stopping in historic Dunsmuir, near Mount Shasta, in Northern California. Near the headwaters of the Sacramento River, Dunsmuir is another 19th-century town full of antique shops and galleries. There also is skiing and snowboard on Mount Shasta, and close by is Castle Crags State Park, which features one of the top hikes in California — a 2,200-foot ascent to the massive granite spires on Castle Crags. This Gold Rush era town in the Sierra Nevada is a liberal enclave amid the ultra-conservative "state of Jefferson." It's home to bookstores, health food stores, antique and clothing shops, galleries, and excellent bars and restaurants. Just off Highway 49, Nevada City's 19th-century downtown is also a national historic landmark. And like Ashland, Nevada City really knows how to do the holidays with its Victorian Christmas, replete with horse-drawn carriage rides, carolers, and seemingly limitless libations.